Historically we have released a new version of Office for Mac approximately six to eight months after Office for Windows. However, following the release of Office 365 we made the conscious decision to prioritize mobile first and cloud first scenarios for an increasing number of people who are getting things done on-the-go more frequently. 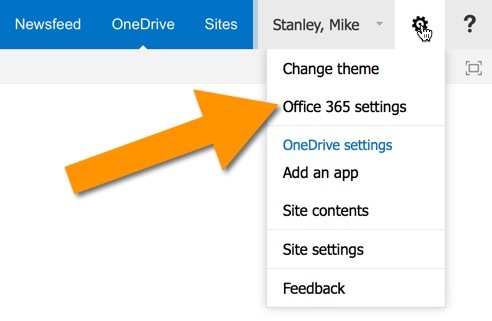 This meant delivering and continuing to improve Office on a variety phones (iPhone, Windows Phone, and Android) and tablets (iPad and Windows)—brought together by the cloud (OneDrive) to help people stay better organized and get things done with greater efficiency at work, school, home and everywhere between. Continuing our commitment to our valued Mac customers, we are pleased to disclose the roadmap for the next version of Office for Mac—including Word for Mac, Excel for Mac, PowerPoint for Mac and OneNote for Mac. First, I love the phrase “conscious decision” – makes me wonder what unconscious decisions would be, especially ones made by giant global corporations. Maybe a product manager comes in one day and announces he had a dream in which he decided to delay the release of a popular software package for three years instead of the above-mentioned six to eight months. Second, let me paraphrase that in my own “I’m mad it took so long to get this update” way. Microsoft released the last version of Office for Mac in 2010. Since then, it didn’t anticipate the PC market would continue its steady sales decline, that the Mac market would become the only strongly growing segment of the PC market, that iOS and Android would completely own the smartphone and tablet space, and that it would take the departure of Steve Ballmer and the arrival of a new CEO with less attachment to the rivalries of the past to wake up the largest software companies in the world to the possibility that it could make more money spreading its software to other platforms rather than really only supporting its Windows and Office on Windows cash cow. We’ll have waited 5 years in between Office for Mac versions, but if the new Outlook for Mac is as nice as OneNote for Mac and Office for iPad, it may just be worth it. I have a confession to make. I only started using Outlook on a daily basis a little more than a year ago when I started my current position at the UT Institute of Agriculture. We’re a PC shop, and switching to a PC as my daily driver at the office was part of the deal. So I picked up Outlook 2013 and ran with it. I can’t say I love using it, but it seems to work reasonably well on a fast machine and after getting used to having my calendar and email in the same application, I haven’t had many problems with it. I point that out as context for making it clear that I never really used Outlook 2011 on the Mac on a regular basis, and certainly never used the travesty that was Entourage before that. I setup Outlook 2011 once or twice over the years mainly out of curiosity, but found it too slow for my tastes, and stuck with Apple’s Mail.app for my work email and Gmail for my personal email. If I had to choose a single word to describe the new Outlook for Mac it would be clean. The design is sparse, flat, and simple, and I like it. 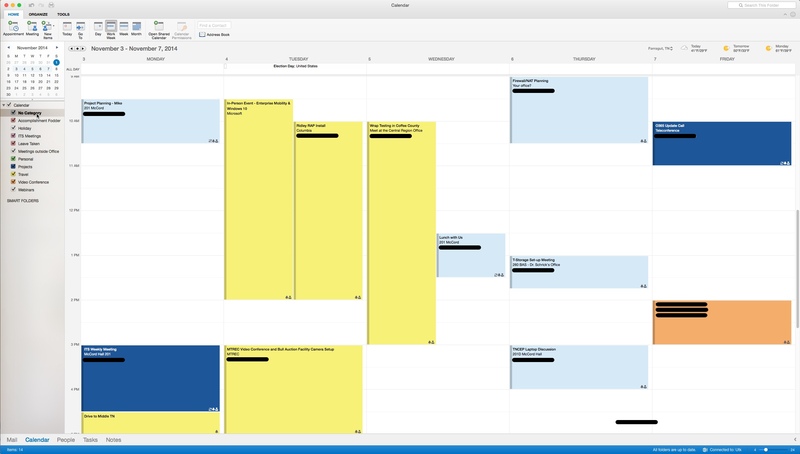 As someone who uses Outlook 2013 every day, it makes sense to me, although it obviously takes some design cues from the new OWA interface as well. I’m writing this blog post on my mid-2010 27″ iMac, so I’ve only used it for more than a few seconds on a non-Retina screen so far, but it looks good. 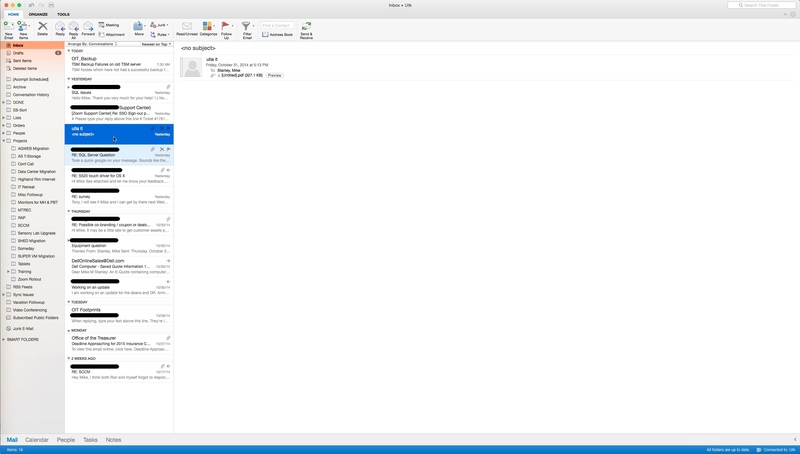 Even on my 27″ iMac with its spinning hard drive, the new Outlook for Mac seems fast. Once it synced all of my mail I did a few searches. While there was a brief delay, accompanied by the increasingly rare sound of a hard drive spinning, Outlook returned hundreds of messages and conversations with the keywords I searched for very quickly. Given how much email I generate and receive these days, being able to find what I need quickly is an absolute must, and this new Outlook does a good job. I’m sure it will be much faster on my Retina MacBook Pro and its SSD, but I thought trying it out on this older machine with a spinning hard drive would be a good test. I mentioned OneNote for Mac above. I think OneNote is one of the best apps Microsoft makes, and I’m sure if I’d used a PC on a regular basis until last year, I would have discovered and liked it sooner. I use it all the time at work, at my desk and on the go. I’d used Evernote for years on the Mac, but always hated that anybody I wanted to share a notebook with had to pay for a premium account like I had. OneNote lets me share notebooks with coworkers, family, and friends without asking them to spend money. Microsoft released OneNote for the Mac this year, and really improved OneNote for iOS. They’ve also released Office for iOS and are expected to soon release Office for Android. It’s about time, and I hope this new, more platform-agnostic approach serves them well. I also hope they realize that 5 years between versions of Office for the Mac is way too long. I’m glad this new Outlook for Mac is out, and I’m glad it looks and seems to work as well as OneNote for Mac. Just don’t make us wait so long next time, Microsoft. Update: Where Do I Get the New Outlook for Mac? I was discussing the new Outlook for Mac with a coworker and he asked a very good question – would his users’ Outlook 2011 clients simply upgrade to the new Outlook for Mac? Unfortunately, the answer to that is no. Not only that, but for the time being, very few folks at our university will even be able to use this new client. Everyone at the university has an Office 365 account, but only those who have paid for the A3 license upgrade are entitled to the new Outlook, at least for now. At some point in the not too distant future, Microsoft will be granting a different type of Office 365 license to university customers who license Office for all of its faculty and staff. That license will grant everyone the ability to download and use Office on personal computers and the iPad, and should, I believe, allow for use of the new Outlook for Mac. 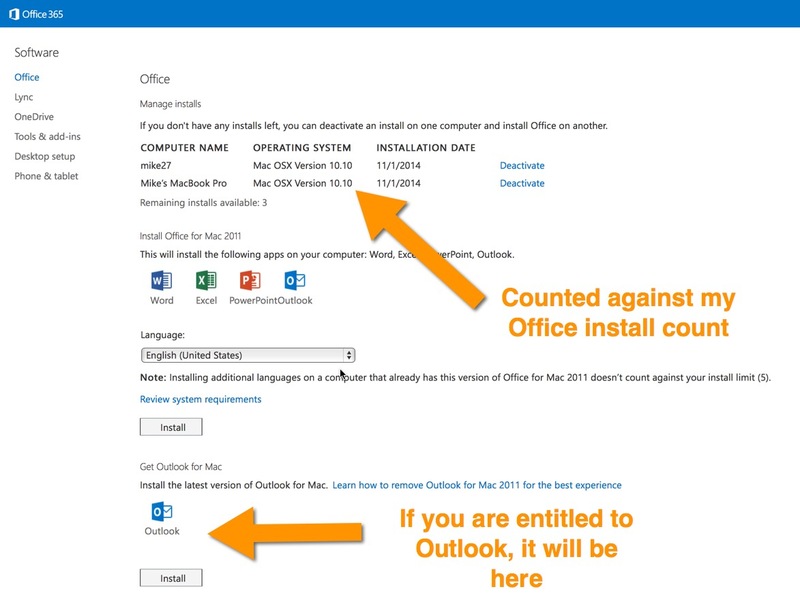 For the time being, you can see if you have access to the new Outlook for Mac by logging into the Office 365 portal. 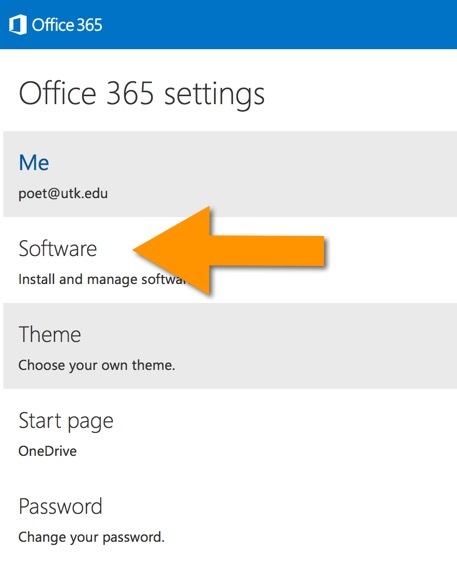 Once there, click on the gear icon in the top right of the page, as shown here, and select Office 365 Settings. On the next page, click on software. If all you see is Lync or OneDrive, you’re out of luck. And by the way, I hope it goes without saying that you should be doing this on a Mac. I can confirm the Mac specific software does not appear to be available for download on a PC. If you’re entitled to the new Outlook for Mac, you will see it below the section listing Office itself. On my Macs, Office 2011 is available, and as a separate download, so is the new Outlook for Mac. One interesting thing to note is that installing just Outlook for Mac on a computer uses up one of the 5 available installations. So Microsoft is clearly signalling Outlook for Mac is not “free” like OneNote for Mac – it requires an Office license just like Word and Excel would. Hope this clears up any questions you may have about the new Outlook for Mac. If it doesn’t, feel free to reach out over Twitter. This entry was posted in Applications, Cloud Services and tagged Microsoft, NaBloWriMo, Office 365, vDM30in30. Bookmark the permalink.